What are those yellow vine flowers that smell like jasmine? 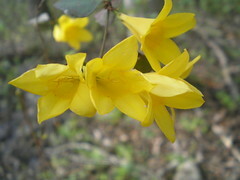 Yellow jessamine (Gelsemium sempervirens), native to the U.S. southeast (and the South Carolina state flower, although these examples grow in Lowndes County, Georgia). But don't eat them; they contain a compound similar to strychnine and said to be as effective as hemlock. Nonetheless, sometimes used as a sedative.